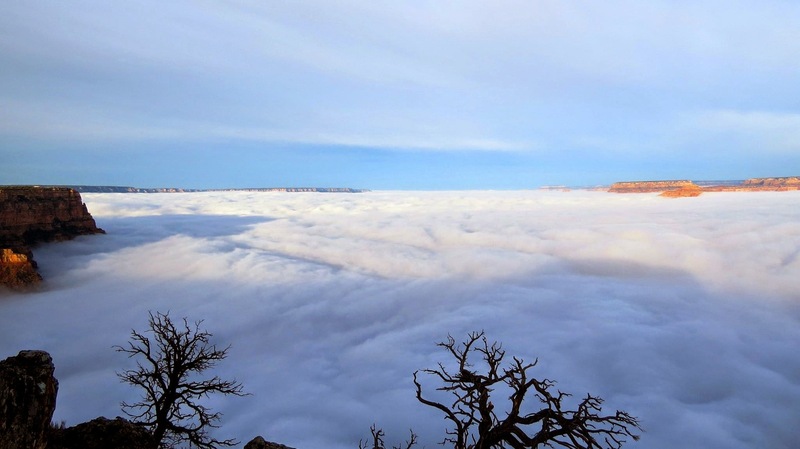 For the second time in two years, visitors to the Grand Canyon in Flagstaff, Arizona, U.S., have been treated to a rare and strange weather event known as a temperature inversion. It occurs at night when skies are clear, winds are calm, and the ground rapidly loses heat stored during the day. 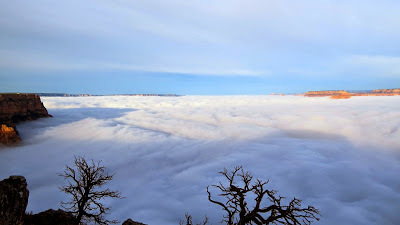 A cold, moist air mass settled into the canyon last week, eventually creating a 500' (152 m) thick low stratus deck of clouds, along with fog that hovered at the canyon rim or spilled over. Grand Canyon National Park staff remarked on their Facebook page, "Almost looks like the tide coming in and going out" (VIDEO HERE).